04.13.2004 - I was very proud of this dead animal removal. The homeowners had called out a different company first, but they could not find it. They actually called two other companies, but the one guy was too fat to even get under the house, where the animal clearly was. Granted, the access hole was very small. I squirmed my way through the hole and started to crawl around. I had very little room because of the very large ductwork lining the area. I basically had to navigate my way through a maze of pipes and ducts, with no light, a bad smell, giant deadly spiders (maybe an exaggeration), and it was not easy. I crawled for a very long time in search of the smell, but I could not find it despite all of my best efforts. I was also having a great deal of trouble narrowing down the odor. Normally I can follow my nose, but not in this case. I noticed that the home had a vapor barrier separating the floorboards. This is common in mobile homes. I began to suspect that the animal may have crawled up inside the vapor barrier and died inside there. In this case, I knew that it would be very difficult! Oftentimes I can track flies and they can lead me to the carcass. However, in this case, I reasoned that perhaps the flies might have been able to pinpoint the area with the dead animal and laid eggs there. I restarted my search, this time looking up at the vapor barrier for such a clue. Sure enough, I found the clue - fly eggs on the vapor barrier. I cut open this section, and sure enough, found the jackpot - a dead opossum. Dead animal removals are either ten minute jobs or two hour jobs. This was a two hour job, but I was very pleased with myself for getting the job done. The grateful homeowners gave me a $10 tip! 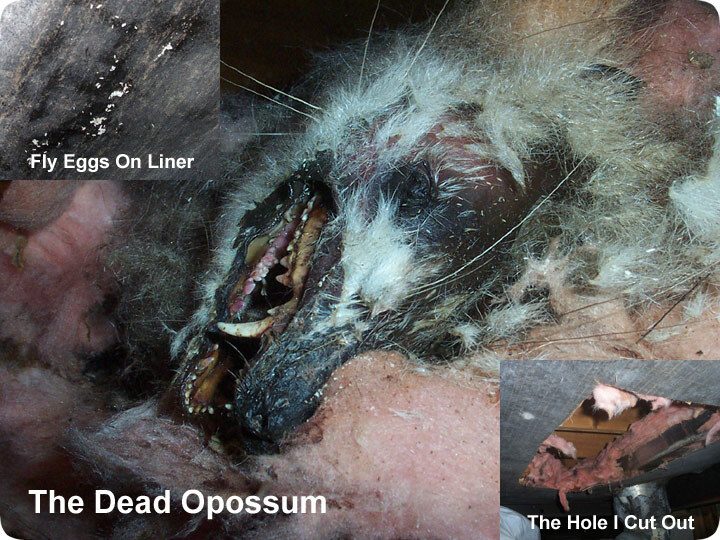 Do it yourself: Visit my How To Find and Get Rid of Dead Animals page for tips and advice.